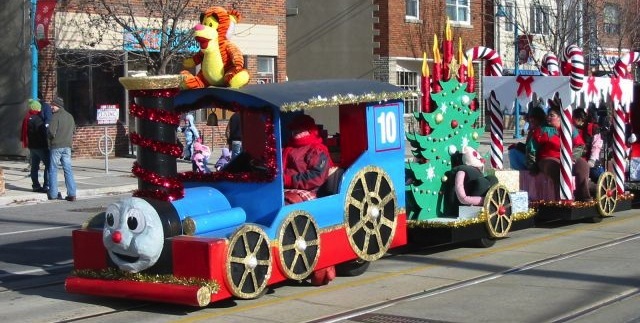 On Saturday, December 3, 2011, the Lakeshore BIA will hold their annual Christmas Parade on Lakeshore Boulevard West. At 8 a.m. the parade will assemble on Birmingham Street, between Dwight Avenue to Islington Avenue, on Dwight Avenue, between Birmingham Street to Lakeshore Boulevard West, and First Street, between Lakeshore Boulevard to Birmingham Street. Formation: Birmingham Street & Dwight Avenue, East on Birmingham Street, South on Dwight Avenue, West on Lakeshore Boulevard West and Dispersal at 3620 Lakeshore Boulevard West. Northbound on Royal York Road, Westbound on Struthers Street; Westbound on New Toronto Street, Northbound on Kipling Avenue, Westbound on Horner Avenue and Southbound on Brown’s Line. It will then return in the opposite direction. The 44 Kipling South bus will return north at the Old Kipling Loop north of Lakeshore Boulevard West. Southbound on Islington Avenue, Westbound on Birmingham Avenue, Southbound on Ninth Street, Westbound to Tenth Street, Northbound on Coin Street, Eastbound on Garnett Janes Road and return in the opposite direction. The event will take place regardless of weather conditions. Members of the public should anticipate traffic disruptions, with local impact on Toronto Transit Commission routes.